The O.G. 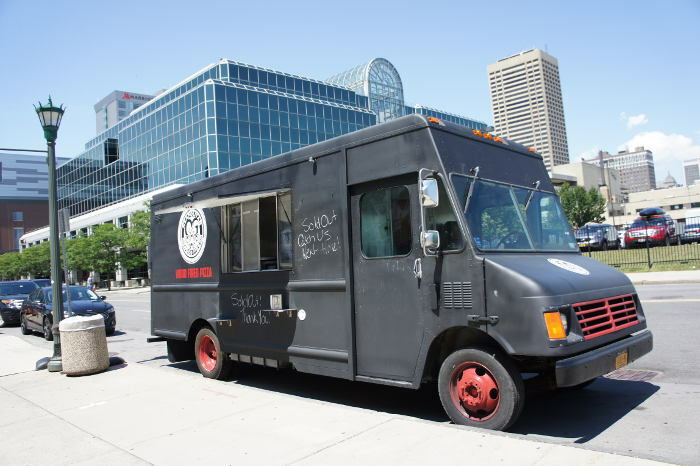 (One Goal) Wood Fire Pizza food truck opened in July 2015 with owner Jay Langfelder promising one thing: world class pizza. Sounds like a tall order you say? Sure it does. 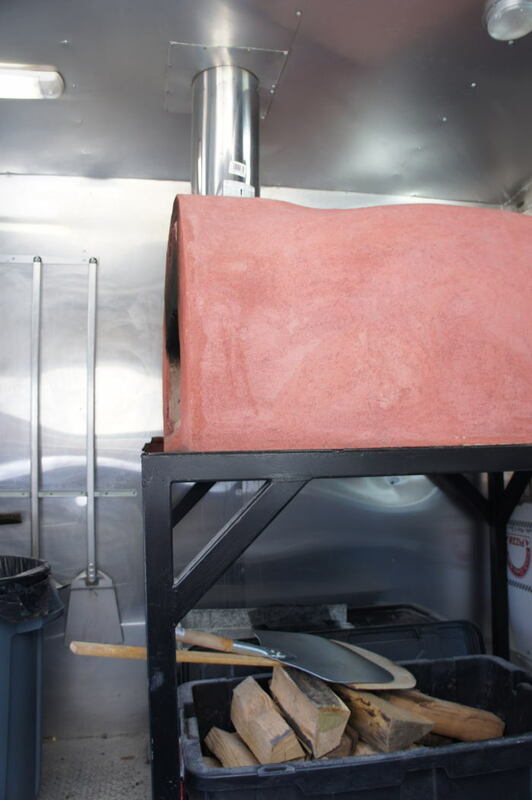 But this guy has a 900 degree wood-burning oven inside his homemade food truck. So I think it’s safe to say O.G. is no stranger to the saying “Go big, or go home”. 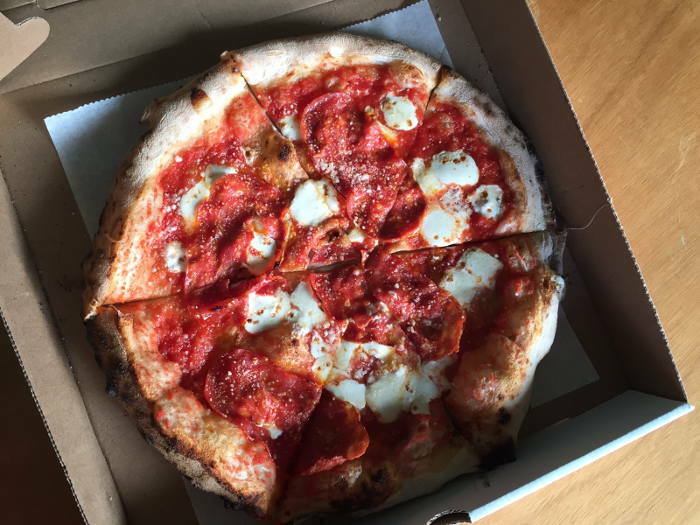 They serve a rotating roster of pizzas made of handcrafted, naturally-leavened dough using an oven so hot it only takes 90 seconds to cook each made-to-order pie. If you’re looking for another Buffalo style pizza, any kind of standard pepperoni with crispy edges, greasy drip-off or sauce overload, it’s best you keep walking to the nearest corner pizza joint. TIP #1: DON’T keep walking. While there’s nothing wrong with a Buffalo pie, it’s completely unlike what you’ll find at O.G. Wood Fire. Actually, they might as well not call the two versions by the same name. We recommend stopping by or seeking out O.G. if you’re a fan of the Neapolitan style pizza of Naples, Italy. If you’ve never had it and therefore don’t know if you’re into it, we highly recommend giving it a try. But it’s important to manage your expectations, which is why we’re here. 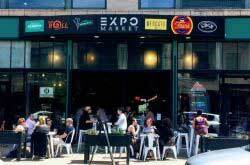 What you get will be great, but it will not be what you are used to from Ninos, Bocce, Imperial and the like. 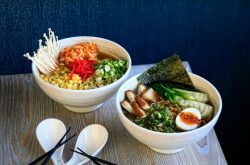 You may not know what some of the ingredients are – it’s okay. Place the order. 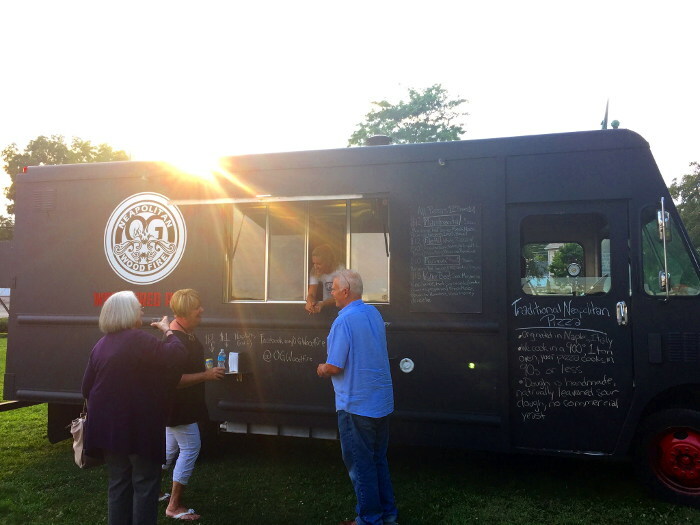 Langfelder has been keeping the menu short during his first month in business, including just three to four options each time he goes out. 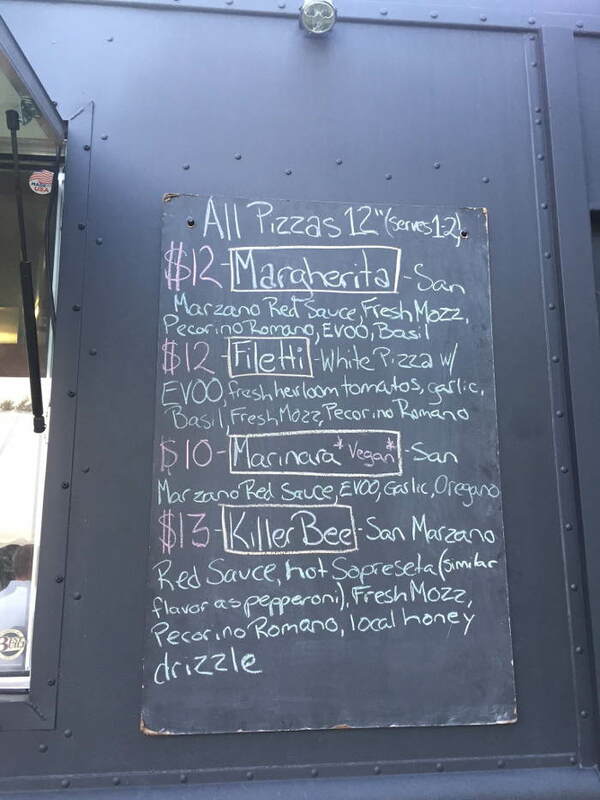 They usually include the standard Margherita ($12-$13) as well as other more specialty options like the Killer Bee or a brunch pizza ($14-$15). Each pie is 12” and serves 1-2 people, AKA what we like to call a personal pizza here at Step Out Buffalo. TIP #2: Get a whole one for yourself and save some for later. A little pricey? We think so. But we get it – you get what you pay for, and we want the best damn fresh mozzarella and soppressata money can buy (most of the time). They don’t sell pizza by the slice, so don’t even go there. See @OGWoodFire for comical commentary on the matter. We visited OG Wood Fire during a village event in Hamburg. This was our second attempt, as they tend to sell out quickly at their regular stops and our first attempt failed miserably. TIP #3: They WILL sell out on you. Go early. The menu that day consisted of four items, Margherita ($12, they’ve since raised their prices) with San Marzano red sauce, fresh Mozzarella, Pecorino Romano, EVOO and basil, Filetti ($12) which is a white pizza with EVOO, fresh heirloom tomatoes, garlic, basil, fresh Mozzarella and Pecorino Romano, Marinara ($10) which is a vegan option with San Marzano red sauce, EVOO, garlic and oregano, and the Killer Bee ($13) with San Marzano red sauce, hot soppressata, fresh Mozzarella, Pecorino Romano and a drizzle of local honey. 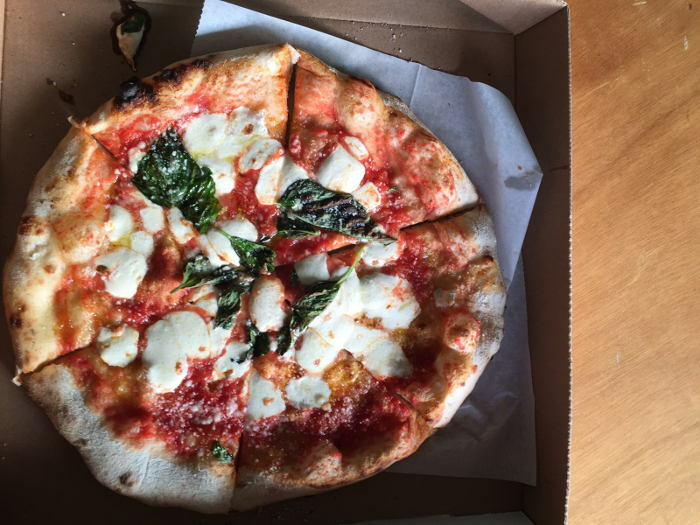 We tried the Margherita and the Killer Bee and loved both. The crust is light and delicious, the sauce subtle and tasty and the toppings on the Killer Bee just adventurous enough to feel both pizza satisfied and gourmet satisfied. The soppressata was outstanding and not too spicy at all. TIP #4: Get meat on it. My only squawk is that one of the pizzas had a little more char on the bottom than I would have liked, ultimately altering the flavor of the pie rather than complementing it. That said, I really appreciate the efforts made to fire these pizzas off quickly and with exceptional flavor from both quality ingredients and the wood-fired technique. Bravo! For more information follow OG Wood Fire on Instagram, Facebook and Twitter.